LEDs look great at night and they can be useful to help with orientation even in the day. Maybe more useful still, you can use programmable LEDs like this RGB WS2812B light board to indicate flight data. 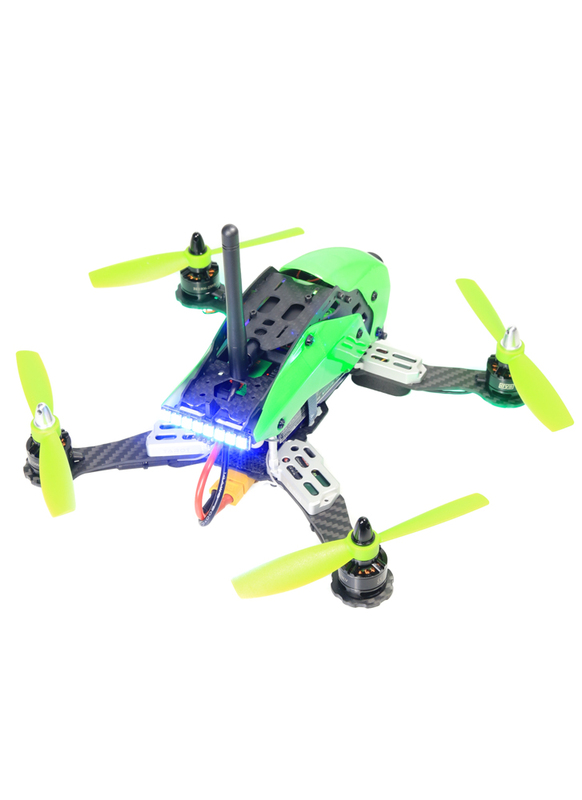 By using different colours, you can program the Naze32 and CC3D flight controllers running Cleanflight to indicate things such as: directional control inputs, battery warnings, flight mode, thrust levels and even RSSI strength. For example, you could program a fading pattern from white to red as you throttle up, or indicator flashes for when you roll right and left. If you want to keep it simple, you can set the LEDs to just sit at a solid colour. Programming the LED board has now been made super easy, thanks to the fantastic new GUI in Cleanflight. We sell a few different programmable LED boards, but this one is our favourite as it comes with a really neat plastic mount. With the mount, it's super easy to attach to your drone and it looks really stylist too. We use this particular LED as a taillight light for our Tarot Robocat racing drone builds; it's the perfect size, it's like it was made for it. As with all 5050 RGB Led boards, it requires 5volts and a ground connection that can be supplied from your flight controller. The remaining connection is a signal wire, which if you are using the Naze32, should be connected to PWM pin 5. How to light your multirotor: Lighting is obviously a necessity for nighttime flying, however it's also really helpful when flying in daylight. Unlike helicopters, multicopters typically lack defining features to help with orientation; lighting is therefore a great solution. It makes most sense to employ a navigational lighting setup - Red on the Port (left) side, Green on the Starboard (right) side and a white strobe astern. When it comes to selecting your lights there are lots of options: LEDs, HPLEDs (High power LEDs), Stripe lights and Strobes. Regular LEDs are inexpensive and come in an array of colours. While they consume little power, LEDs are best suited to nighttime applications as they are usually too dim to be seen in bright daylight. Alternatively the next generation of LEDS, HPLEDs are much brighter. They can be driven by much greater currents meaning that some can emit over 1000 lumens. At night they can be seen for miles but more importantly they are visible in bright daylight. Since overheating is destructive, HPLEDs must be mounted on a heat sink to allow for heat dissipation. Both regular and HP LEDs are easy to wire up - however note that LEDs will only light up with correct electrical polarity and that they have a maximum current rating which must not be exceeded. To limit the amount of current through an LED a suitable resistor should be used. Strips lights are fun when it comes to night flights and are fantastic for orientation purposes. Some can be powered/controlled with an LED RGB Driver to cycle between different modes and colours. LEDs of all types can be turned into a strobe by using asuitable controller, strobes have the added bonus of low power consumption. The key to all lighting installations is to think about voltage and current requirements, a voltage regulator/UBEC will usually be necessary to help meet this requirements. Finally it is advisable to power lights from a separate battery to your flight battery.